If you’re new to real estate, congratulations. I hope your career really takes off in coming time. While our paths may never cross on a transaction, you will definitely be meeting with appraisers and probably developing some pretty strong feelings about some of them too. Today I hope to help you understand appraisers a bit more and give you some tips for working with them. Quality Spectrum: Without really knowing the industry, from afar it’s easy to think that appraisers are mathematical wizards who make precise calculations, but you’ll soon learn that’s not the case. Some appraisers do a great job interpreting the market while others do a lousy job. Can’t Handle Everything: Just because an appraiser holds a license to appraise does not mean the appraiser can or should appraise every property. I find the general public and even some in the real estate community make this assumption. Some jobs will simply be too complex or outside the scope of what an appraiser has done before. In these cases it’s probably best to find an appraiser who already has the developed skill to appraise the type of property or situation you are working on. This is also why a good appraiser might say, “tell me about the property so I can see if I’m a good fit for the job” in the initial conversation about the property. Case-in-point: I referred two appraisals to colleagues last week who were better suited for the valuations at hand. Your Job & The Appraiser’s Job: Real estate agents are advocates, while appraisers are a neutral party to the transaction. I know you know this, but it’s important to consistently realize that appraisers don’t play on your team so to speak. 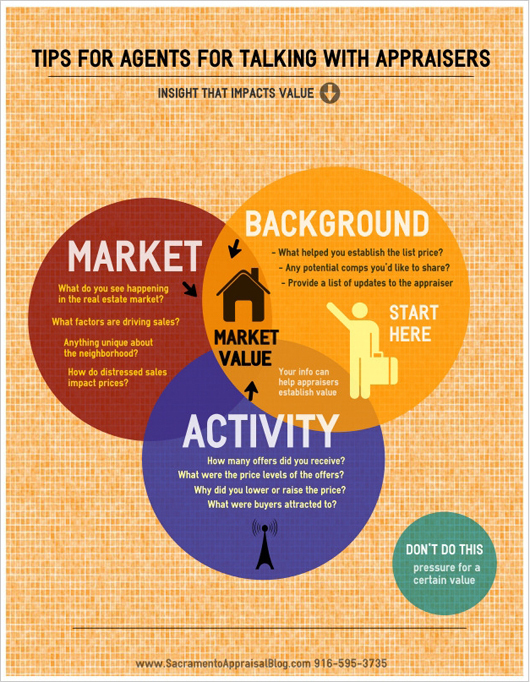 An agent works to get the highest price for the seller or best opportunity for the buyer (and earn money when the deal closes), but the appraiser’s job is NOT to get the highest price or best scenario for either party, but rather measure the market and record findings in an appraisal report. Cranky Appraisers: I’ve heard constant feedback from real estate agents of appraisers who are impersonal, non-talkative during inspections and come across as cranky communicators. What’s up with that? It could be a personality thing, a preference to be very focused and quiet while working, a lack of personal skills, maybe the appraiser feels burned by the way the industry has changed in recent years, maybe it’s arrogance or other times the appraiser might simply have a habit of trying to be as neutral as possible (which unfortunately comes across as impersonal). Whatever the case, expect that some appraisers will talk to you and others won’t. And to my appraiser colleagues, this is a good reminder that it’s still possible to remain neutral and unbiased while being personable. What You Can & Can’t Say: You can definitely talk to appraisers about the neighborhood, market and even the latest sales. Just don’t try to influence appraisers to meet a certain value. This means you shouldn’t say, “this is my first deal, and my kids are super hungry, so please appraise it as high as possible”. Kidding aside, pressure can be very overt like this, but it can also be more subtle. Read 10 things Realtors can say to pressure appraisers if you want a sampling of some ways pressure shows up. It’s easy to downplay this topic or chalk up some of the common statements like “I hope this one makes value” to normative real estate conversations, but listen to the voice that matters most – what your department of real estate says about influencing appraisers (see what California says here (pdf)). By the way, if you’re looking to communicate more effectively with appraisers, check out Quick tips for agents for talking to appraisers and Agents, be ready to answer these questions when appraisers call. Understand the Report: Grab a coffee and scone and start reading through appraisal reports when you get them (I know that sounds dull, but the coffee is going to keep you awake). Instead of only looking at the bottom line value, start scanning some of the most important parts of the report such as comp selection, adjustments given, neighborhood description, neighborhood boundaries and the final reconciliation of value. If you’re brand new, this might sound like I’m speaking martian, but these are all sections in the appraisal report, and in my opinion some of the meatiest parts of the valuation that should help tell the story of value (or show glaring errors that the appraisal doesn’t “cut the mustard” so to speak). I actually have a two-page example report for you to download so you can learn to spot the top items to review in the appraisal report. Don’t Become Jaded: Here’s the deal. You’re going to have some appraisals that mess up your deals. I’m so sorry they won’t all work out. Sometimes this will be due to the price being too high in the first place, but other times you’ll simply get some bad appraisals. This won’t be easy to handle, but nonetheless I recommend striking a professional posture by refusing to become jaded or an incessant complainer. Don’t get me wrong, there is definitely a place to complain about bad appraisals, but when that becomes your shtick, it’s not a good vibe for business. No matter what, try to be emotionally fresh for the next transaction instead of angry when you meet up with a different appraiser. I hope this was helpful. If it was, please share it with your office or colleagues. Let me know if you have any questions, insight or further tips. Comment below or send me an email. Question: If you are a real estate agent, what would you add to the list? I was quoted a few times in this month’s California Real Estate magazine article entitled “The Problem with Appraisals.” This is the official magazine of the California Association of Realtors, so I’m honored to have been asked to share some thoughts on the challenge of appraising in today’s market as well as tips for working with appraisers. Check out the article if you’d like, and let me know what you think. Realtor Resources: If anyone is visiting my corner of the web here from the magazine, thank you so much. I really appreciate you stopping by. Feel free to poke around as you’d like, stay in the background or introduce yourself. If you like what you see, you’re welcome to subscribe to get posts delivered by email. It’s my constant goal to be a resource to Realtors and build strong relationships, so that’s one of the reasons I consistently write posts. In case you’re looking for some tips on helping communication flow a bit better with appraisers, check out Five questions to ask yourself before giving comps to the appraiser or Agents, be ready to answer these questions from appraisers or How to challenge a low appraisal (a format I developed). Thank you again for stopping by, and thank you to all regular readers. I sincerely appreciate you. Questions: Do you feel appraisers are being too conservative in today’s market? Any stories to share? With such a shortage of inventory right now, as a real estate agent, how do you tell the difference between market appreciation and overpaying?